Do you know about the 125,000 different kinds of benefits that are provided in USA? Prove your student status wherever you go. Access over 42,000 student benefits and discounts in more than 130 countries. DGIST gives the ISIC issuing services for our students. to fantastic discounts and services at home and around the world. 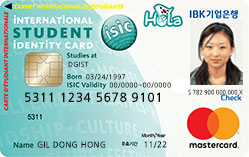 ISIC card holders are members of a truly global club. to take advantage of offers on travel, shopping, museums and more, worldwide. Enrolled student of college & graduate school of DGIST. Student Portal System Login for Student Certification. Student Portal System → Select a card type and Fill in the registration. After online application registered, Issuing fee should be paid through online payment system. Check your application at MY ID and output of ISIC issuance certificate. 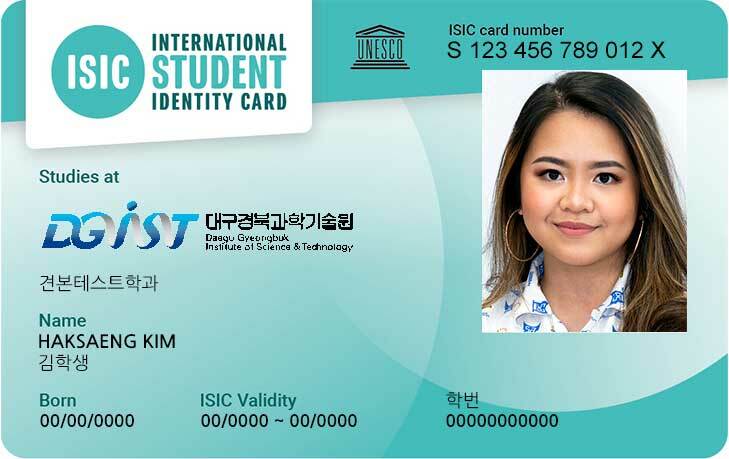 Central Administration B/D 1F, Student Team (☎ 053-785-5152) - You can get your ISIC at Student Affairs Team 3~4 days later After online application registering and payment. The KEB HANA Bank (any branches of all over the country) - You can get your ISIC with Check card right there. 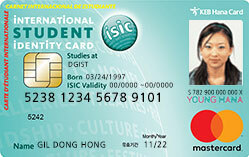 When you fill in the registration, you can select the validity period of your ISIC. ID Validity start~end mark: You can select the validity start month within 3 months from the time of your applying.